I n the midst of the unsettled governor’s race in Georgia, Brian Kemp has resigned from his role as the Secretary of State effective as of 11:59 AM of November 8, 2018. On last Thursday, Kemp stated, “We earned a clear and convincing victory at the ballot box, and today we’re beginning the transition process.” All ballots in the state have not been counted, but Kemp is already taking actions to “transition” into his new position before the results have been finalized. On that same day, Governor Nathan Deal appointed Robyn Crittenden to serve as Interim Secretary of State for the remainder of Kemp’s term. 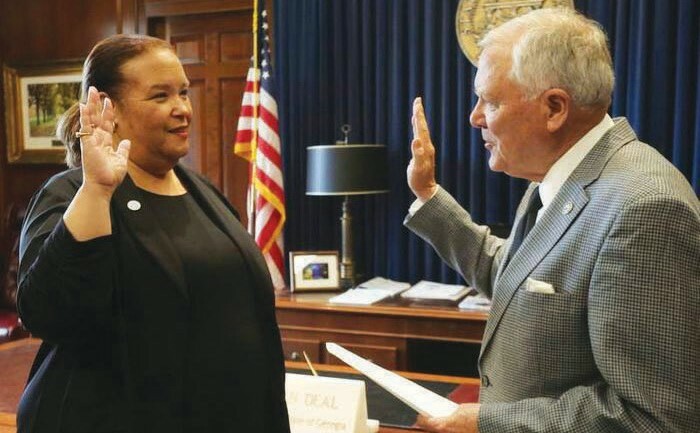 Robyn Crittenden has made history, for she is the first African American woman to serve as a statewide constitutional officer in the history of Georgia. Crittenden is no stranger to the world of politics and governmental affairs. She has served as the commissioner of the Georgia Department of Human Services, co-chair of the Older Adults Cabinet with first lady Sandra Deal, Executive Vice President and Chief Operating Officer of the Georgia Student Finance Commission. Her new found responsibilities as the Secretary of the State of Georgia includes: registering corporations in the state of Georgia, overseeing licensure of certain professions, and regulating the state’s securities market. One of her responsibilities that is crucial to the Abrams V.S Kemp controversy is that she will certify election results for the State of Georgia. “Georgians can rest assured that I’m going to give this job my all, and that we’re going to follow the law,” says Crittenden. A runoff election on December 4th between Republican Brad Raffensperger and Democrat John Barrow will will decide who wins a four year term as Georgia’s Secretary of State.